Myself and Anne did this walk on Monday 27th September 2010. The day after we had finished our walk along the Wayfarers Walk at Emsworth which is also the starting point of the Solent Way. 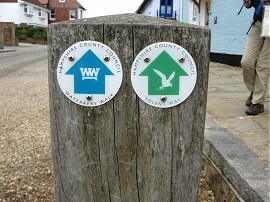 The first four or so miles of the route shares the same path as the Wayfarers Walk and we had had a long debate over whether to start the walk at Emsworth, which was my choice, or at Bedhampton where the two route diverge which was Anne's preferred start having walked the path in between just the day before. Eventually a toss of coin decided in Anne's favour however she graciously conceded her victory and thus we set off from Emsworth. 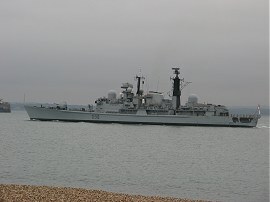 We had met up earlier on the seafront at Portsmouth where we saw the naval vessel HMS York, photo 1 sailing up Spithead before heading over to park by the Cathedral which cost an extortionate £8.50 for eight hours. 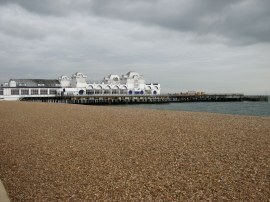 I had had a long look around the area the day before and could not find anywhere cheaper until Southsea which would have then made the walk a bit short. From Portsmouth we took one car over to Emsworth where we were able to grab the last space in a small free car park located off Bridge Road. 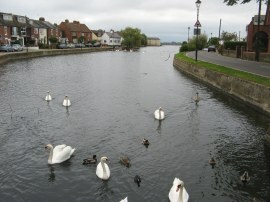 From our parking space we headed across the A259 Havant Road and down the side of the tidal mill pond, photo 2, along the Bridgefoot Path to the start of the walk proper on the harbour front at Emsworth, photo 3. Leaving Emsworth we headed out along the Promenade which separates the Mill Pond on the right from the waters of Chichester Harbour, photo 4. The day before the harbour had been full of water but this morning the tide was out, the only water being in the deeper channels that headed out across the harbour. Leaving the Promenade we headed along the shorefront path, photo 5, before heading slightly inland along a footpath running along the edge of Nore Barn Wood. Leaving the trees through a rather heavy metal gate the path crosses a narrow field and then heads alongside another larger field to join a track that runs besides the large cemetery at Warblington. 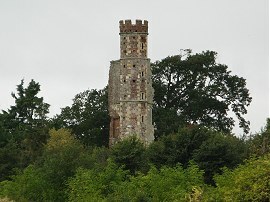 As we approached the cemetery we could see the remains of Warblington Castle rising above the trees, photo 6. This was a fortified brick and stone manor house built between 1515 and 1525. 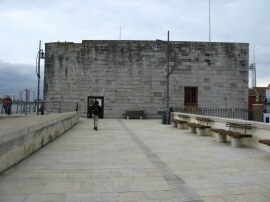 Now only one of the two turrets of the main gate remains after its almost total destruction in the Civil War in 1644. 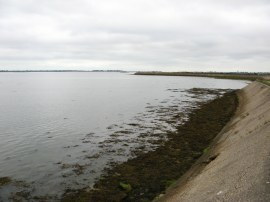 The route then passes through a small section of the cemetery before heading diagonally across a small field to rejoin a footpath running along the shore front. 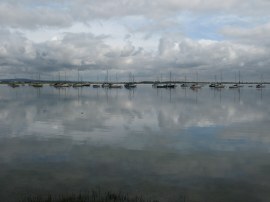 The route then continues round the edge of Chichester Harbour, with views over to Hayling Island to the left. Ahead of us in the far distance we could also see the Spinnaker Tower in Portsmouth which was located close to our final destination of the day. As the path approaches Langstone it crosses over a small beach area, photo 7, which would probably be impassable close to high tide although there did appear to be a narrow path running above the wooden boards which line the back of the beach. Rejoining the footpath proper the Solent Way heads past Langstone Mill, photo 8, and the Royal Oak Pub to reach Langstone High Street where I took photo 9 of the way marker used for the route. 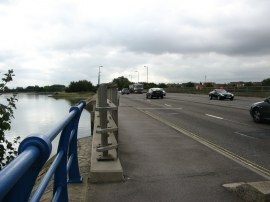 Here the route heads up the High Street before crossing over the A3023 Langstone Road and continuing ahead along a path which leads to Mill Lane. Reaching the end of the lane the route crosses a small stream and heads to the left along a channel back to the waterfront, the path now running alongside the waters of Langstone Harbour, photo 10. 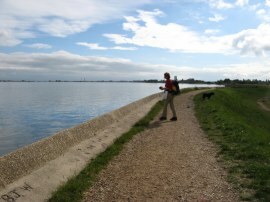 The Solent Way now follows the edge of Langstone Harbour for some 6 miles as it makes its way down to the southern end of Portsea Island. From Langstone the path was rather uneven and it was easier to walk along the edge of the concrete retaining wall, although this was rather narrow in places. Shortly after crossing a small bank of shingle the route diverts inland for a while alongside another channel. 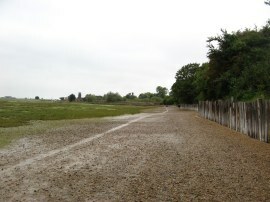 The path heads past a gravel works to eventually reach Harts Farm Way at Bedhampton which was a significant point as it was where the routes of the Solent Way and Wayfarers Walk diverge. Here we headed to left alongside the busy road running through an industrial estate. 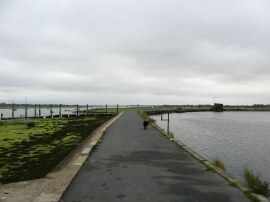 Soon after crossing a bridge over an inlet the route joins a footpath on the right that runs back underneath the bridge to rejoin the harbour side path. 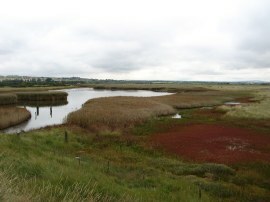 The path heads around the harbour to join a tarmac cycle path running alongside the A27 before bending round to the left around the edge of more tranquil Farlington Marshes. 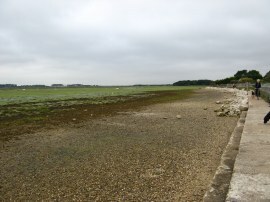 As we were walking along the shore line the tide was gradually coming the in, the waters almost imperceptibly rising to cover the mudflats, until they had reached the seawall, photo 12. The path round the edge of the Marshes, photo 13, is followed round back up towards the A27 from where there where good views over to the Portsdown ridge we had walked along the previous day. Just before we reached the main road we stopped for a short lunch break before continuing on our way alongside the busy noisy road. 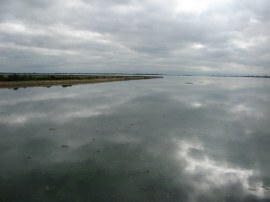 The day had started quite gloomy with a very low cloud base but at this point they gradually began to break up, the growing gaps in the cloud being reflected on the smooth surface of the water, photo 14. 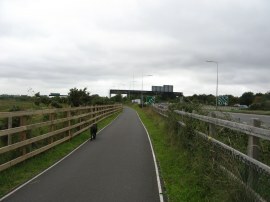 Fortunately the path soon leaves the A27, heading to the left alongside the A2030 to take the road bridge over Ports Creek, photo 15, onto Portsea Island. 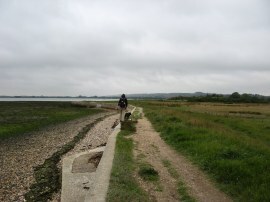 Once over the creek the route joins another footpath running along the waters edge of Langstone Harbour. Not far from the bridge we passed a trig point, S2653, half hidden in some bushes. Reaching Kendalls Wharf the path heads through a small area of pine trees behind another gravel works before continuing on along the shore past a sailing club and a metal fenced activity centre. 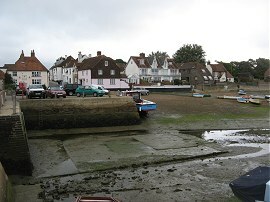 The path then continues down alongside the harbour, photo 17, the route often running quite close to the A2030. High tide was due around 2:15pm which seemed as good an excuse as any to take of photo of Anne heading down the path, photo 18, in the brief spell of sunny weather we had. The path heads alongside Milton Common, where there are three ponds to the right of the path, although we only spotted the second and third of these, known as Duck Pond and then Swan Pond. 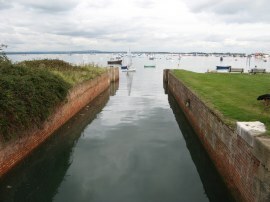 Reaching some houses by Milton the Solent Way finally leaves the harbourside path to head inland for a short distance, the path initially running besides Milton Lock, photo 19, which was sea lock for the Portsea Canal. Just before we left the shoreline we had stopped to talk to another dog walker while a man was trying, with much difficulty, to launch a small sailboat; at one point climbing on board before falling almost straight back out in to the water. From the lock the route heads along a track to reach Locksway Road where Zuka found an unopened Chicken and Mushroom Pot Noodle on the ground which she proudly carried for some distance. Locksway Road is followed as far as Stowe Road where the route heads down to the left. Reaching the end of this road the route continues ahead along a footpath running across a park to reach Henderson Road. 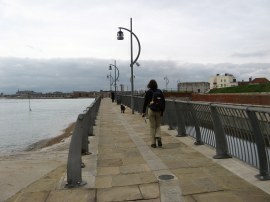 Turning to the left the route then follows the road as it bends round to the right to the Esplanade where the path rejoins the seafront and for the remainder of the days walk the Solent Way now follows the sea front path all the way to Old Portsmouth. 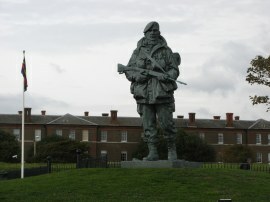 A short distance down the Esplanade we stopped for a short snack break on a bench opposite the Royal Marines Museum which is housed in part of the old Eastney Barracks, the entrance guarded by the imposing statue in photo 20. 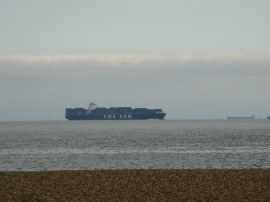 Out at sea a large container ship, photo 21, was making its way steadily along the Solent, eventually disappearing from view as it entered into Portsmouth Harbour. 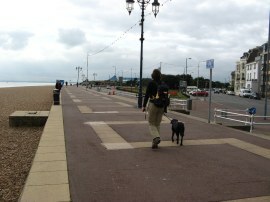 After our break we resumed our walk along the seafront, photo 22. The weather had once again become cloudy and dull and a light wind had also sprung up which made the air feel considerably cooler. For much of the day it had been dead calm with the smoke rising from a chimney which we could see as we walked round Langstone Harbour rising vertically into the air. 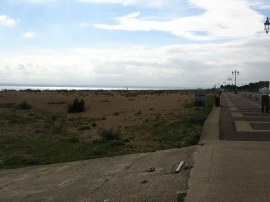 A broad path runs alongside the road with a shingle beach to the left and a succession of small parks to the right. The section of the Esplanade between St Georges Road and St Helens Parade was closed to traffic due to re-surfacing works which gave us a fairly peaceful stretch of walking, apart from where the road works were actually taking place, as we headed towards Southsea Pier, photo 23. 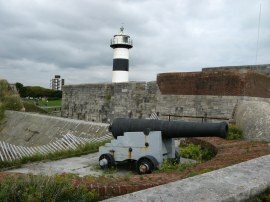 From the pier it was then only a short walk further along the seafront, photo 24, until we reached Southsea Castle. 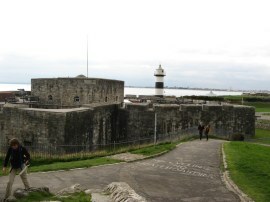 Southsea Castle, photo 25, is one of Henry VIII's Device Forts, built in 1544 on the waterfront at the southern end of Portsea Island and was built to guard the eastern entrance to the Solent and entrance to Portsmouth Harbour. 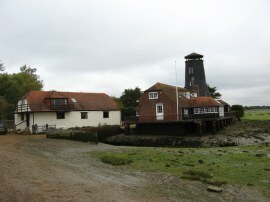 During its existence the building has had many uses and a lighthouse was built on the site in the 1820s, and is still in use by shipping today, photo 26. 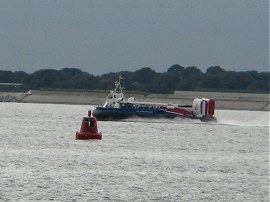 While we were looking round the edge of the castle a hovercraft, photo 27, set off towards the Isle of Wight from the nearby hoverport, the only passenger hovercraft route in the country. Leaving the castle the route heads along the Clarence Esplanade which runs alongside Southsea Common. 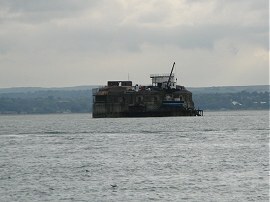 Out at sea in the Solent channel we could see the Spitsand Fort, photo 28, which was completed in 1878 to assist in the protection of the Solent Channel and Portsmouth Harbour. Besides the esplanade where a large number of monuments and memorials reflecting the extensive naval heritage of the Portsmouth Docks. 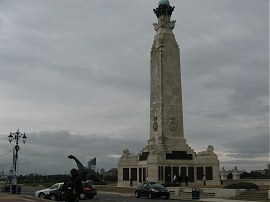 These included the Crimean War Memorial, photo 29 and the Portsmouth Naval Memorial, photo 30. 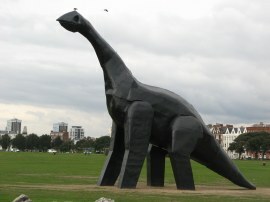 A short distance further along Southsea Common was a giant 53ft high dinosaur sculpture known as Luna Park, photo 31. 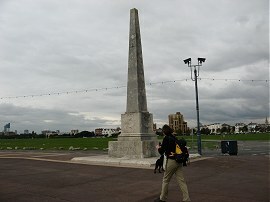 This sculpture is part of the exhibition and is due to be removed in October 2010 although I think it would make an attractive permanent addition to the seafront. 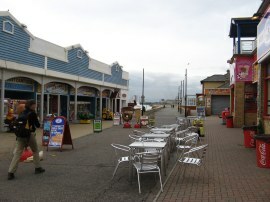 Soon the route reaches the amusement arcades and fast food stands of Clarence Pier, photo 32, before joining a footpath that crosses a low bridge over the remains of the Spur Redoubt and then runs alongside the moated ramparts of the Kings Bastion and Long Curtain Battery, photo 33. 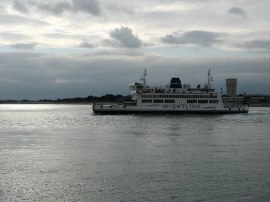 To our left a Wightlink ferry, photo 34, was heading out to sea at the start of its journey to the Isle of Wight. 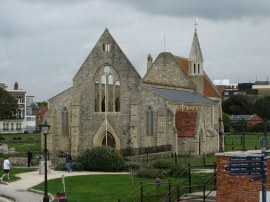 The historic buildings were coming thick and fast as we walked the final few yards of this stage of the Solent Way. Just past the end of Long Curtain the path heads past the Royal Garrison Church, photo 35 and on over the Saluting platform to reach the Square Tower, photo 36, where we finished this stage of the walk. From the tower it was just a short walk down the High Street to our parking place by the cathedral. Reaching the car we had walked a total distance of 16.4 miles of which 15.8 were along the Solent Way. This had been a thoroughly enjoyable walk from the picturesque water front around Chichester Harbour to the historic buildings and memorials of Portsmouth; definitely one of the best walks of the year. 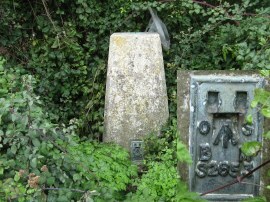 As usual I have uploaded the route of the walk which can be accessed here: Solent Way Stage 1 Route.